“We have some good ideas here. But the only way to know if they’re workable is to try to make them fail. If we fail to fail then maybe we’re on the right track.” Oscar Scott Card, ‘The Lost Gate’. Can it really be 6 months since we launched The Hub at 100% Design? The time has simply flown by. The feedback we received after 100% Design Week confirmed what we already knew – that The Hub looked good and performed well. But there is always room for improvement and the last 6 months have given us valuable time to do some more thorough trialling; to amend and tweak the prototype. Some of these amendments came from client feedback; some came from what was observed during production; some were just the designer’s wish to make the product sharper and even more effective. The Hub has now been trialled in four quite different environments, so it has had a real test. With each test, there was the nervous anticipation that maybe this time, things wouldn’t quite go to plan, that, maybe this time, some little glitch might happen to raise concerns. But each time, the Hub failed to fail! We can continue to move forward, confident that the Hub has been able to perform to a high standard in each of these environments: in the office, in a workshop, in a showroom and in an exhibition hall. Internal Upholstery – What started as blinds has now developed into sturdy, easily removable, fabric panels on a hardwood frame which are simple to remove and update. 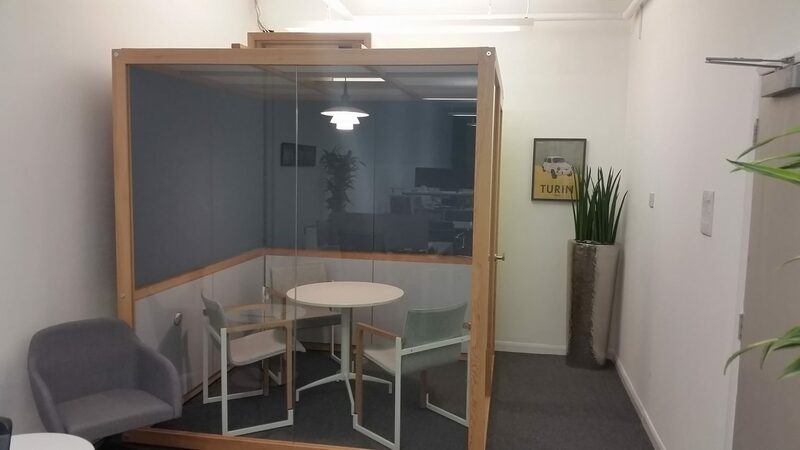 They now include an air gap which has the benefit of improving the acoustic performance. Electrics – There have been three improvements electrically. Firstly, inbuilt ‘plug and play’ looms from Office Electrics have been incorporated which means that clients do not need to have an electrician on site during installation. Secondly, the addition of removable, laminated panels gives ease of access to the electrics. Finally, channelling has been built in as standard to allow total flexibility in locating sockets, air vents and switches. Enhanced natural air circulation – The addition of manually operated ceiling shutters improves air circulation, but also has the added benefit of allowing the penetration of water through a sprinkler system in the event of fire. Doorplate – Better door alignment has now been achieved with a discreet doorplate. These are the most obvious changes to The Hub. Other production-led improvements have been made, but on the whole these are largely unseen (and only known to the designer!). Most importantly, on Tuesday 5th April, The Hub was set up in our showroom in Clerkenwell at 19, Britton Street. It is manned daily from 9am to 5.30pm. Do come to view The Hub in its new surroundings.